The era of the in depth up front analysis is long gone. There is an important phase between the moment an idea pops up and the moment the project enters execution mode, where we design and implement the solution. During this phase, we should clarify the link with the enterprise strategy. This ensures everyone involved knows clearly what business or enterprise value we are aiming for with our project. It will also bring to surface potentially conflicting goals early on, ideally even before there is an official project, so that counter measures can be taken. This is not just about stating something abstract like “this project will help improve customer experience”. Rather, we are looking for more specific goals like “increase the customer’s sense of privacy when visiting our offices”. This allows us to validate solutions (how do you expect each solution to contribute to the strategic goal? ), discuss and set priorities in case of conflicts with other goals, and actually measure value creation after project delivery. As a BA, we have the analytical skills to clarify this link, so we really owe it to our organisations to take up this role. Furthermore, this pre-project phase is the moment where you start shaping the solution and the approach to create the solution. Shaping means you create a rough picture without diving into details: enough to bring about constructive discussion and help clarify the points that need further investigation in order to create and validate the business case. You want to establish the information needed to allow you to decide whether or not to invest in the project. There is a delicate balance between doing too little or too much, so iteration is key. Also, having a BA in the lead at this stage is of significant value, as he looks at the idea from an investment / value perspective rather than a planification perspective. Both at strategic and solution level, it’s important to be clear about the assumptions we are making. What makes us believe our solution will help achieve our strategic goals? Don’t just believe what you and your stakeholders think, but specify hypotheses, measure, refine and reduce waste along the way by preventing ineffective investments, big and small. Every project is a change project, so in everything we do, we will confront people with change. As a BA, it’s easy to be positive about a change that’s not affecting ourselves. However, when was the last time you did something for the first time? 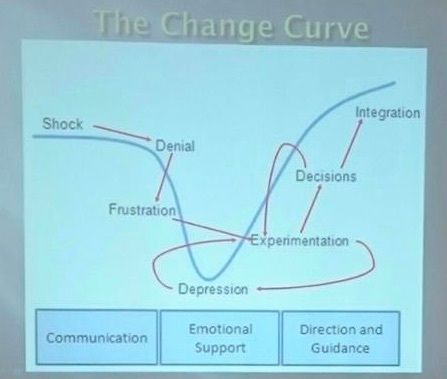 Are we fully aware of the full impact of the change, also emotionally? Are we offering the right support at the right time? This is not only a responsibility towards people undergoing the change, but also to the stakeholders triggering the change: we must ensure they are aware of their impact. Excellent listening and facilitation skills are essential when taking up our role as change agent or changemaker. While hearing is a physiological process, listening is a psychological process that requires our full attention. Are you listening to really understand or simply waiting for your turn to speak? Next time, start your response with “yes, and …” and notice how much more difficult it becomes not to listen. Really listening builds respect. Respect for each other’s opinions, ideas, backgrounds, … Another good example of showing such respect and appreciating other people’s context, is in the terms we use. For example, would you prefer to work in an organisational silo or a cilinder of excellence? Are you managing stakeholders on your project, or relationships? And it’s not only about us listening to stakeholders, but also about getting stakeholders to listen to each other. This is where good facilitation skills are an essential tool in our toolbox. They can make the difference between gathering input from your stakeholders and have them co-create solutions. Your personal energy can really engage your audience, and creative techniques trigger conversations and spark new ideas. For example: have stakeholders write down requirements on cards, make them stand up and sort the cards in a stack from high to low priority. You’re bound to get some insightful conversations. Or simulate your business process with Lego or by walking around on a big process map with swimlanes. It will give people a new perspective on things. In short, it was apparent in many sessions that the BA is well positioned to do more than just gathering and documenting requirements. The BA can and should take up a more impactful role, at project and organisational level, and even beyond (perhaps at next year’s BA Conference?). While this is not new, honestly looking around in the enterprises we work in, tells us there is room for improvement. 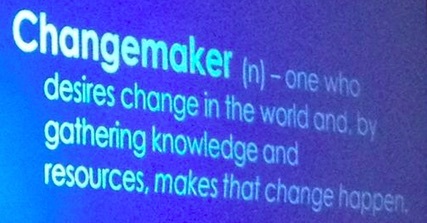 So, why not become a changemaker yourself? And find some peers or a good mentor to support you. It will help you build confidence, another important but often overlooked ingredient in our toolbox. Overall, the conference was a big call to action towards us to take up these challenges and help our companies create their future. It’s going to be an exciting journey. Are you up for it? Check out AssistKD’s key messages. Have a look at pictures and tweets at Eventifier. I also warmly invite you to check out some of the people that inspired me during the conference: Craig Watson, Adrian Reed, Alec Sharp, Neil Mullarkey, Giorgiana Mannion, Nigel Chambers, David Beckham, Craig Rollason. Interested in building your leadership skills as a BA? Have a look at the book Business Analysis and Leadership: Influencing Change.